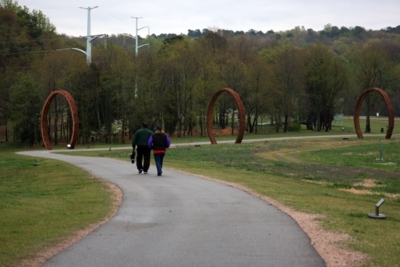 My mom wanted to do the museum park walk at the NC Museum of Art when she was in town in March. I’d been hoping to check it out since the museum reopened, and so I jumped at the chance. 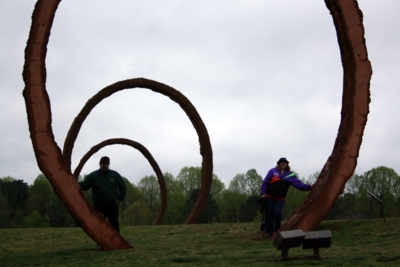 While my sister slept in the car—it was way too cold for her LA sensibilities—Mom, Tim, and I took about a mile walk through the rolling lawn and forested areas of their park, pausing only for photographs of the sculptures along the way. 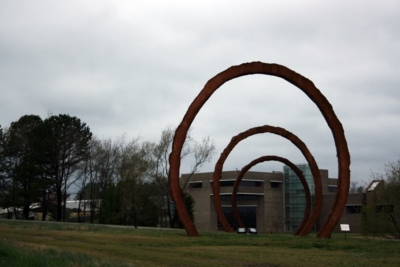 I was surprised to see Vollis Simpson’s work was the first of several art pieces we passed. 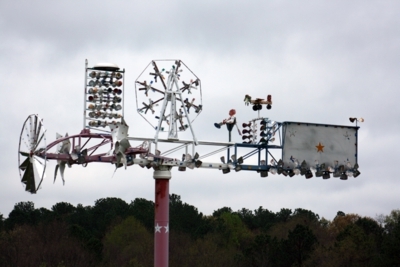 Wind Machine by Vollis Simpson, 2002. 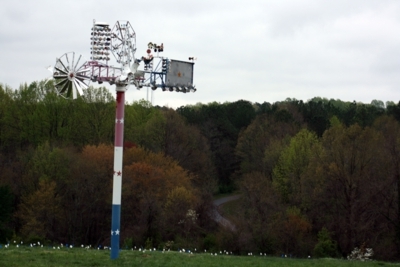 Ben and I went on a whirligig adventure in 2008 to find his creations. 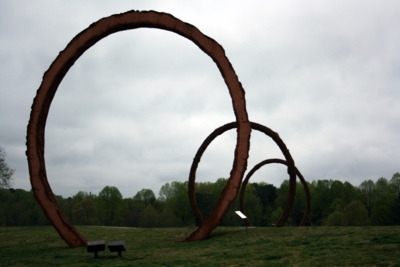 Whirligigs are the large metallic sculptures the artist makes, and they move with the wind. He’s recently had to relocate them from his property in the NC countryside because he can’t take care of their upkeep anymore. 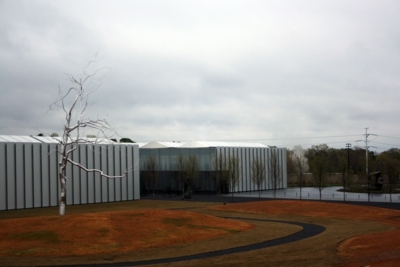 Looks like the NCMA is one of the lucky new owners! 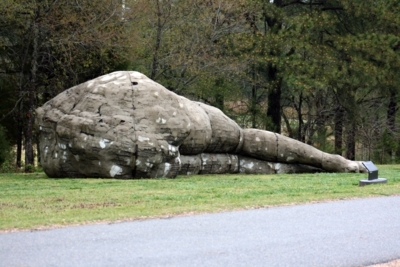 Next down the trail is Collapse I, Untitled by Ledelle Moe, 2000. This work is very appealing to me, probably because of my fantasy writing. 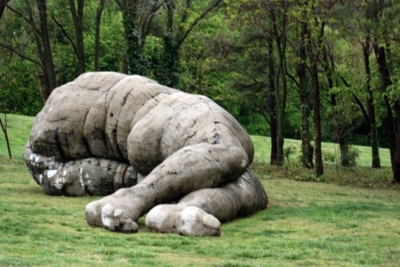 What fantasy fan doesn’t like coming across a crumbling giant? 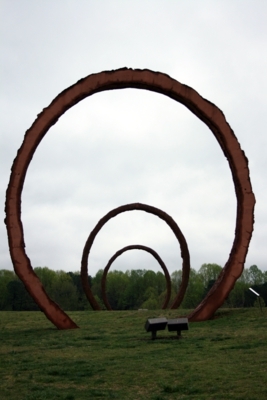 The next sculpture is called Gyre, and it’s by Thomas Sayre, 1999. It creates a beautiful skyline, but the best part is seeing how peering through the circles from different directions shapes how you see the area. It’s an excellent piece. I could spend quite some time taking photos of that work until I felt satisfied. A little farther down the path and at the first fork is Crossroads/Trickster I, Martha Jackson-Jarvis, 2005. It reminded me a lot of an ear of maize. 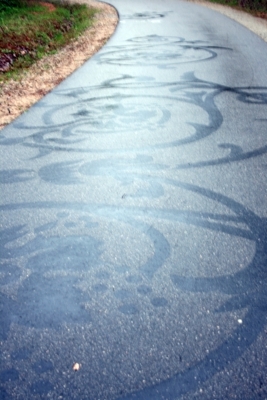 Onward, we walked, seeing the creeping pattern of Steed Taylor’s Invasive, 2008, appear. 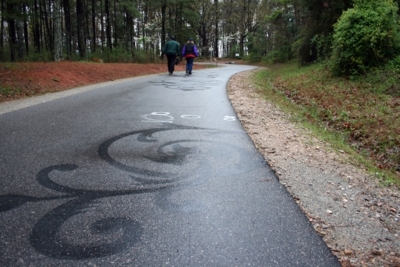 As the path is worn down through weather and use, the artwork is designed to slowly fade away. 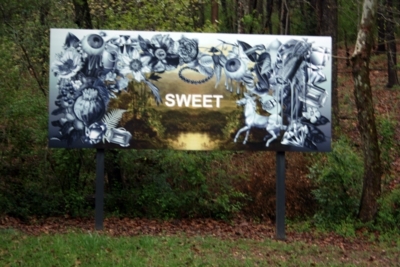 Next up were a series of large paintings that appeared around different curves of the House Creek Greenway Trail—and since they’ve changed now and I can’t find the trail map I used, I don’t have an artist to credit for them. 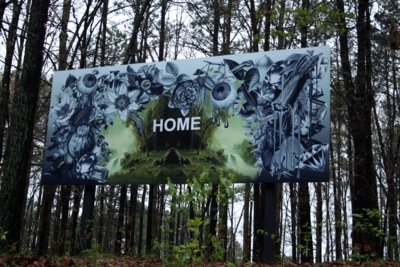 I believe they were called Home Sweet Home, though I didn’t capture the last Home on film. Unfortunately for me, the Cloud Chamber for the Trees and Sky was closed due to weather. 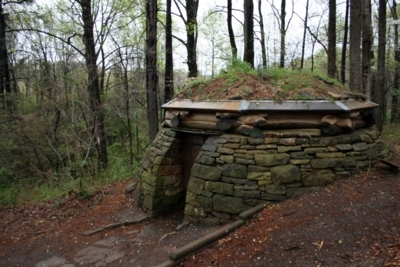 A creation of Chris Drury, 2003, the cloud chamber functions as a pinhole camera, bringing an image of the sky inside the chamber so those inside can feel like they are walking above the clouds. I must come back when the weather’s better. 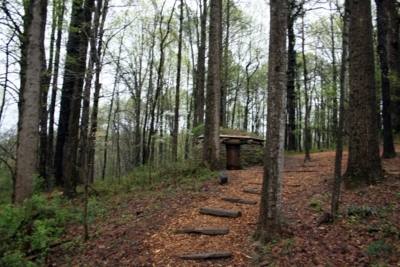 And yes, it reminds me of a hobbit home. We stopped our walk at that point and headed back toward the parking lot. 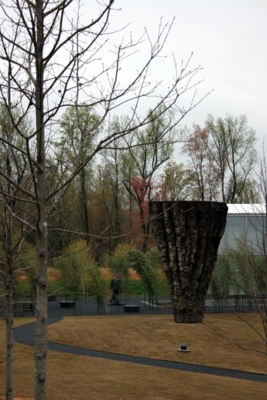 Near the museum proper, I noticed two final sculptures. One was a silver tree that honestly took me a while to realize wasn’t a real one. It’s called Askew. 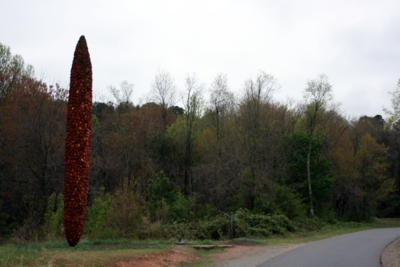 And the last was Ogromna, a top-heavy work that makes me want to climb it if I had some harnesses and a zip line down. 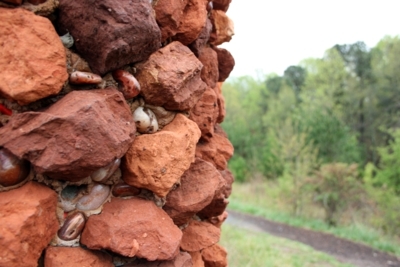 All in all, the museum park is a great area to get some fresh air and stir some artistic musings while you’re at it. I’ll definitely be back on a nice day to see the cloud chamber, not to mention that I haven’t been in the museum itself yet!